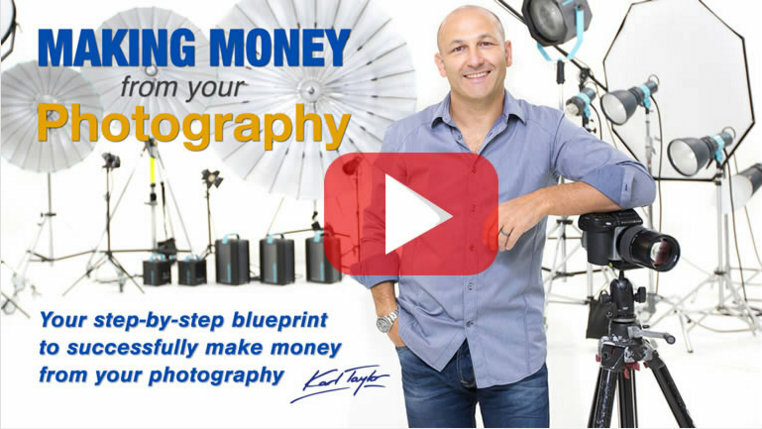 Today is Thursday, October 15th, 2015 and is the release day of Karl Taylor's "Make Money From Your Photography." Since I purchased it at 6:45 a.m. EST, I'm guessing that I'm one of the first in the US to buy it. I've already completed all 3 videos on the same day of my purchase, so here's my review of the program. Keep in mind that this is all just my personal opinion. You'll have to decide for yourself whether you think the program is right for you. The program is broken down into 3 videos of about 1 hour each. It is geared more toward the commercial photographer and/or B2B photographer not the consumer photographer. My least favorite part of the 3 videos is about the last 15 minutes of video 1. I don't feel that section added as much helpful information as the rest of the content. However, out of roughly 180 minutes, I can handle 15 minutes that kind of loses my attention. On the other hand, I really enjoyed part 2 and part 3 of the series. Can a consumer photographer that does weddings, families and babies benefit from the program? The answer is yes, but I still feel the program is not geared toward those photographers. I do however believe without a doubt that commercial photographers focusing on B2B can gain helpful insights and make a difference in their photography business especially those that are just starting out or want to become full time. The way I evaluate any investment into my business whether equipment or training is by asking, "Can it help me make more money and/or do my job better?" I do feel that Karl Taylor's "Making Money From Your Photography" will help me make more money. The program is well worth the investment for me as a full time commercial photographer. I feel that I will get my small investment back many times over. If you are a new photographer that doesn't know which way to go (decisions, decisions - consumer or commercial) or are a part-time photographer pursuing commercial photography or even a full time commercial photographer like myself, don't hesitate purchasing this program unless you are trying to decide whether to pay your electric bill or buy the program. If you are that broke, maybe you should wait until you can spare a few extra dollars. As with any program, you will likely not get your investment back overnight, but you will immediately learn how to approach things differently if you don't have the experience in the business side of photography. I really like how Karl dives into pricing, marketing and the general business side of photography. However, I still feel that it applies more to commercial than consumer. Yet, consumer photographers can still benefit from the 3 hours of information. For me, the program is just about gaining a couple of key points that will multiply my investment. That's exactly what the program has already done for me on day 1. It has given me new ideas that I didn't have before watching it. As with all of Karl's videos, this series is high quality and well done. If you don't own any of Karl's other programs, I highly recommend that you look into his training. FYI, I am not affiliated with Karl Taylor Photography. I'm simply a fan of his training.